Air Fryer Pressure Cooker Honey Bourbon Chicken Wings use both a Pressure Cooker and an Air Fryer, for moist meat and crisp skin. So, I have recently been trying out the GoWise 3.7 Quart Air Fryer and am totally impressed. One of the things I wanted to do, was to do a side by side test with my famous Pressure Cooker Honey Bourbon Chicken Wings recipe, which I finish off in the oven. 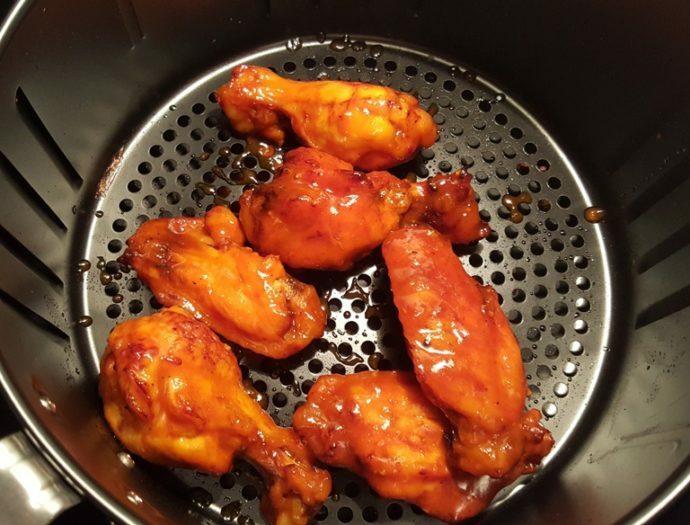 I made the Pressure Cooker Honey Bourbon Chicken Wings in my new GoWise 8 Quart Pressure Cooker and finished off half the wings in the Air Fryer and half the wings in the oven, to see which is better. 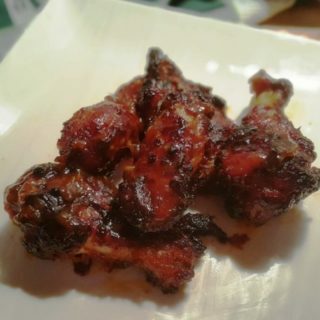 Hands down, this Air Fryer Pressure Cooker Honey Bourbon Chicken Wings cooked in the Air Fryer won by leaps and bounds. The Air Fryer rendered more fat out of the skin, which gave the skin a nice solid crunch. The meat itself, was firm, not soft, like after being baked in the oven. Plus, the cook time in the Air Fryer was much shorter than in the oven. Please join my Facebook Air Fryer Recipe Group and join in on the fun! The onions and garlic get a bit of a sauté and then the rest of the ingredients are added right in the Pressure Cooker cooking pot with the wings. Five minutes after pressure was reached, I had cooked wings, but not crispy skin, like everybody loves. Using Silicone Coated Tongs, I carefully placed the wings into the GoWise Air Fryer and they crisped up on both sides. 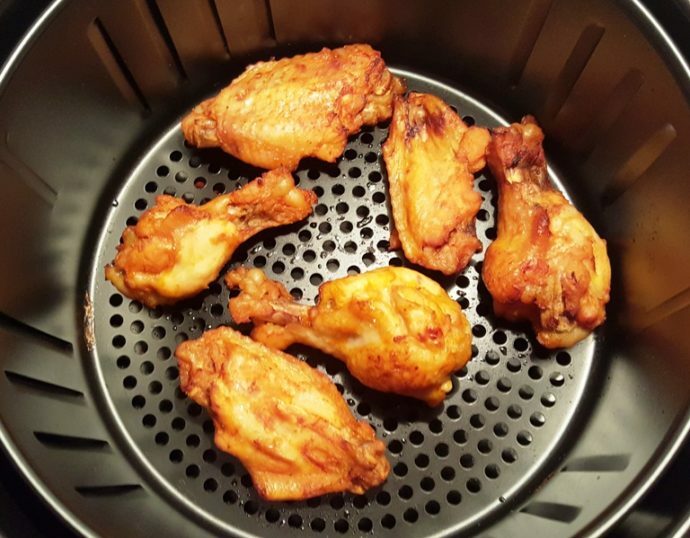 I adore this GoWise Air Fryer! I hated my last one because I had to flip and shake and flip and shake. While the wings were crisping, I thickened the sauce in the Pressure Cooker. When the sauce was thick, I dunked the wings into the sauce and then placed them back into the air fryer. The sauce will caramelize on the wings nicely. Look at the gorgeous color! If you like this recipe, you might want to try my Asian Sticky Chicken Wings or my Buffalo Hot Wings. Wowza, delicious Honey Bourbon Wings from start to finish in under 30 minutes. 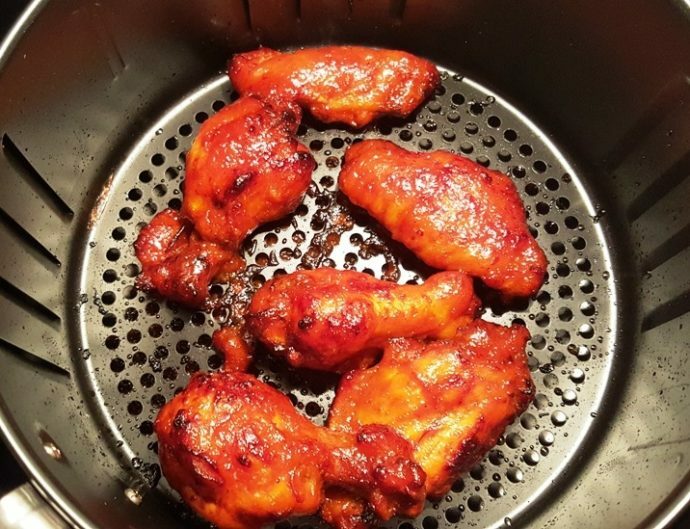 If you do not have an air fryer, please use this Pressure Cooker Honey Bourbon Chicken Wings recipe and finish the wings in the oven. Push the Sauté or Browning button on your Pressure Cooker. Add ketchup, liquid smoke, brown sugar, onion and garlic to your Pressure Cooker cooking pot. Stir until sauce starts to thicken, about 5 minutes. Add the water and the rest of the ingredients. Carefully add the wings and mix into the sauce. When Beep sounds, do a Quick Release. With tongs, gently remove wings from the Pressure Cooker and place into the Air Fryer Basket. Turn the Pressure Cooker to Sauté or Browning and allow sauce to thicken while the wings are crisping in the oven. Place basket into air fryer and set temperature to 400 degrees Fahrenheit for 6 minutes. When Beep is heard, remove the basket from the air fryer and dunk wings into the sauce in the Pressure Cooker cooking pot or dump wings into a bowl and toss them with sauce. Return the wings to the Air Fryer and set temperature to 400 degrees Fahrenheit for 6 minutes. Shake wings in the air fryer halfway through, if desired. 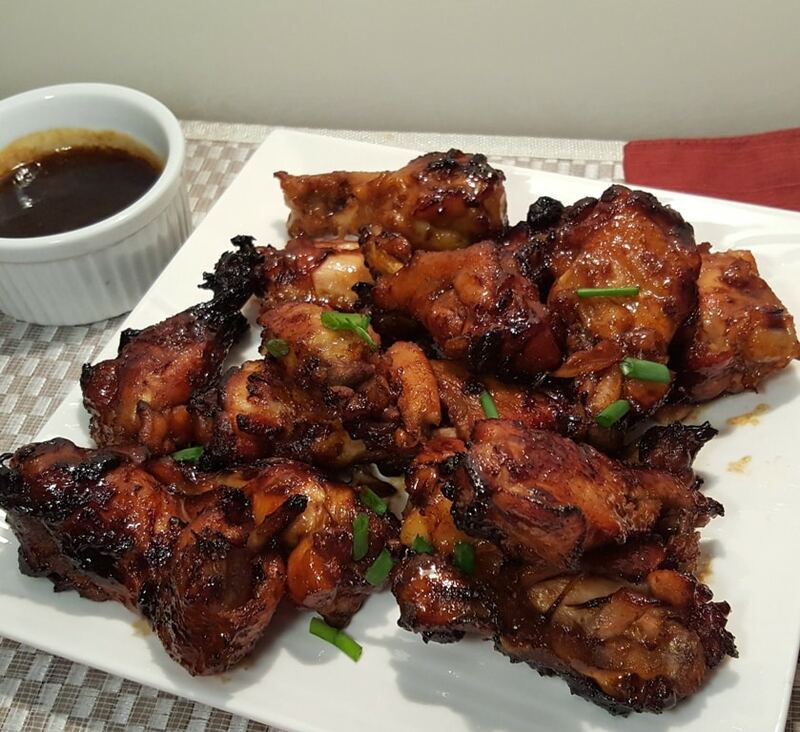 PIN this Air Fryer Pressure Cooker Honey Bourbon Chicken Wings! Hi Jill, I’m using skinless boneless thighs. Does the time remain the same? Also going to make a batch to freeze, same cooking time? The cook time will be the same. I am not sure what you mean about the same cooking time on your batch to freeze. Do you mean for cooking frozen at a later date, or freezing an already made batch? I don’t have any bourbon, but do have some dark rum. Would it be advisable to use that and maybe add some fresh squeezed orange juice ? Honey-rum-orange flavor ?? Pennie, that sounds quite good! Jill, should I adjust the time when using skin-on, bone-in chicken thighs? I can’t wait to try this recipe. 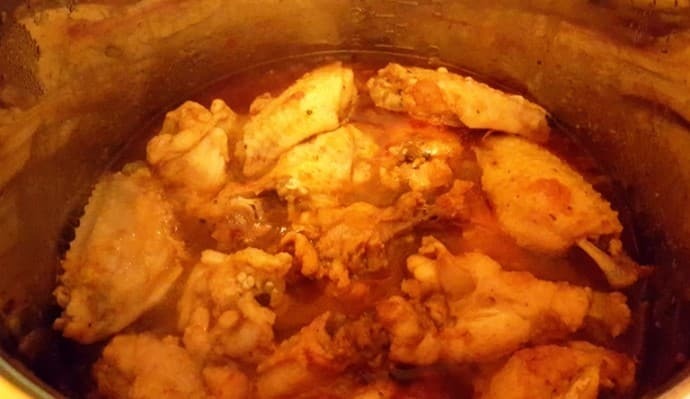 Did you use frozen or thawed chicken wings when cooking in pressure cooker? Can they be frozen? Thanks! !